texts available | translations in German, English, Bosnian, Spanish, French, Greek, Italian, Spanish-Jewish, Latvian, Dutch, and Turkish. For the project Suspended Spaces, Mehmet Yashin revisits his own work and comes up with a variation on his poem Dead House. This piece is presented on one of the outer walls of the partitioned structure which accommodates many of the show’s video works, on the first floor of the Maison de la Culture in Amiens. On this wall, the French translation of the title (“Maison Morte”) is written by hand; a little to the right, the poem, in French, covers the entire partition , and is visible from several yards away. 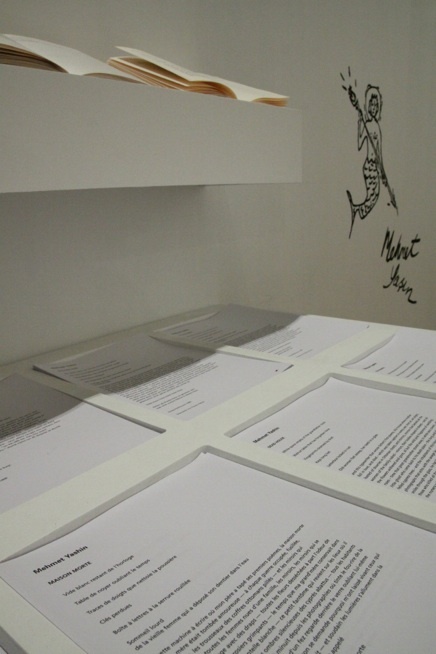 Beside it, a display table presents this poem in ten different languages, with each translation printed on a sheet of paper that is available for visitors. At the side of the display table a set of headphones enables visitors to hear the writer reciting the poem in his mother tongue, Turkish. 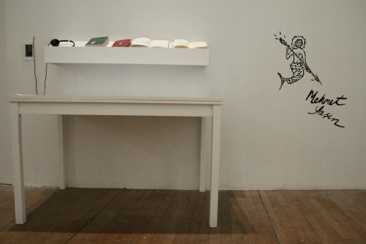 Last of all, on the far right, in the lower part of the wall, Mehmet Yashin has drawn the “seal” with which he signs all his writings, representing a fish-man, a male mermaid (which sounds very like the pronunciation of Yashin’s first name). On a small shelf there are two versions, French and Turkish, of his collection Constantinople n’attend plus personne, illustrated by this same male mermaid. In Dead House, Mehmet Tashin evokes the house of his childhood, which his family, and he himself, were forced to leave during the winter of 1963 (known as “Bloody Christmas”), when he was just five. Located in Neapolis, the last cosmopolitan neighbourhood in Nicosia (Cyprus), it was then looted and set fire to by EOKA, the National Organization of Cypriot Combattants (a nationalist, anti-communist and pro-Hellenic organization which wanted self-determination for the island and its attachment to Greece). Mehmet Yashin lost certain members of his family during that conflict. As a hymn paying homage to a dead house, the words talk of time passing and the pain of loss which still remains intact while “the cackle of war rings out”. In offering the same poem in ten languages, Mehmet Yashin questions the universality of his personal experience, as he does that of his poetic output. 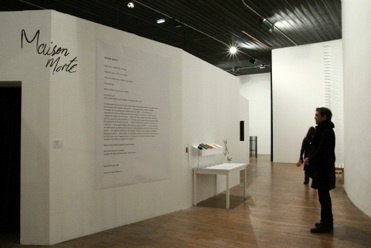 Preferring the poetic space to that of nations, Medhmet Yashin does not take up any political or written stance, as an epilogue to his collection which was published in French under the title Constantinople n’attend plus personne (2008, Bleu autour): “The space of my identity can only be my poetry”. Mehmet Yashin is interested in small slippages and shifts, and in the accidental filters and transformations for which the very praxis of translation is a metaphor. Nothing but poetry can bring me back.